Lumix DC-FZ80 Digital Camera is rated 4.2 out of 5 by 20. Rated 5 out of 5 by James from Good Value, rugged too I recently purchased this camera for a safari in Southern Africa. It performed flawlessly the entire time. I was able to get pictures with the 1200 mm lens that the Cannon people with their 300 mm lenses could not. Their body alone was three times what I spent for my Panasonic. I could not shoot multiple frames as fast as the more expensive cameras was the only downside. I even gave the camera a 1 meter drop test while showing accessories. It came out with a few dings in the flash cover and no other damage after dropping 3 feet onto the dirt! This is a good value for your money. Rated 5 out of 5 by Anonymous from superduper zoom, hell lots of features Just got my fz80 yesterday. Here are the pros and cons. pros: 1) Great great great zooming camera. gives optical+intelligent + digital zoom. max zoom is upto 6700mm. Here is 4k moon max zoom test https://www.youtube.com/watch?v=dTkMRFgA1BU 2) loaded with lots and lots of features namely 3 types of 4k photo burst, post focus, full hd to 4k video shooting, 240 fps video@480p,120 fps video@720p, 60fps @ full hd and 30fps @ 4k, 24 types of photo modes, 10 photo effects, raw + jpeg support same as DSLR's, dedicated macro zoom, so on... 3)good low light performance 4) best entry level bridge camera for 4k video shooting especially shooting landscapes. 5) heavy and bold, feels sturdy 6) wifi connectivity with devices is noteworth, mobile application gives remote view and control for the camera. cons: 1) a bit noisy display 2) would be best in the range if it had manual focus rings like that of zs60 in the price range. overall, for the price range in combination with features and superzoom bestone to go for with latest updates and technology. Rated 5 out of 5 by Ana from Could not be happier! I have previously owned the Lumix DMC-FZ70 and upgraded to the FZ80. I could not be more thrilled by the clarity! The camera is excellent in low light with few pixelations with blown up and the zoom clarity is outstanding. The close-ups are also much improved from the earlier versions. Honestly, if you don't want to lug around a lot of heavy equipment but still value a great shot, this is the camera for you! Rated 5 out of 5 by Hot Pockets from Lumix owner for some time I have a few Lumix cameras. Had this for a few months now. I'm no camera tester, but I know what performs and what doesn't. Did purchase (and returned) a different manufacturers camera based on claims. I returned to what works for me, Lumix. These are my personal likes and may not be yours, but the DC-FZ80 focuses fast, and I was surprised that a zoom lens this long actually was sharp (not dedicated lens sharp), but held very good sharpness through out the 20mm wide through the 1200mm telephoto. It has many bells and whistles for a 'Point & Shoot'. My go to's are the ability to shoot 4K video at almost full zoom, 120 FPS slo-mo video (720p), 4K burst of images, built in flash, incredible macro & zoom combination, view through an LCD or through a viewfinder, large amount of image controls, effects and options that I haven't explored yet. One downside is that the LCD is not adjustable. If you're a professional photographer, go with a DSLR, you may be disappointed in thinking it equals a $3800 camera & lens. If you want the best in a point and shoot, at a price that is worth four times that amount of quality and features, this is the camera to get. One last note; it has good all automatic shooting modes, but may be a bit intimidating for someone who wants just a point and shoot. Rated 3 out of 5 by Anonymous from Nearly great near but far from good far - part 1 I purchased this camera for wildlife photography, specifically birds. My primary gear is a mirrorless system but there are times when hauling all that gear is not feasible. I was drawn to the affordable price, ease, reach of the camera and the flexibility to shoot in RAW or JPEG.I've had this camera for about 3 weeks and have put it to the test in different light and weather conditions. I wanted to love it as it has much to offer but the results have not been what I had hoped. On the plus side.. it's comfortable to hold and carry for hours; though the controls take a bit of getting used to, once learned, they are fairly straightforward; it has tremendous reach; decent but not outstanding battery life (which is considerably shorter when using burst or 4k and the EVF); and the image stabilization works better than I expected. Where this camera performs best is in bright light, wide open, and between 20mm-100mm (though when trying to shoot macro I could not get as close as 1cm away - which the instructions say you can -- without the camera refusing to take the photo and warning me I needed to be farther away). (Bug on fence). At the telephoto end of the zoom range, fine detail is lost. The images are unacceptably soft and, for me, not suitable for posting or printing. (Anhinga on branches) The camera does a nice job in bright sun with manageable noise. Images are best between ISO 80 and ISO 400 but forget about taking a decent image in low-light or dappled or filtered light (e.g. under a tree canopy even with bare branches). While shooting RAW exclusively, images at ISO 400 or more were very degraded and difficult, if not impossible, to rescue in post processing. The other noticeable issue is that the AF is not reliable. In AFF (for tracking objects with unexpected motion) or AFC, the camera spent far too much time searching and failing to lock on the subject. I ended up with far more, and far too many, unusable shots. So, reluctantly, I will be returning the camera. Rated 4 out of 5 by Woodguy from Good camera, not perfect I wanted a bridge camera with good zoom so I wouldn't have to haul around my mirrorless Sony and extra lenses.? I read lots of reviews and settled on the FZ80.? It does some things incredibly well; for example, you can get very close to the subject you're photographing--practically touching the subject with the lens.? The rear screen is good, though I prefer to use an EVF.? That brings up one of the problems--I'm not a huge fan of its EVF for a couple of reasons. 1) There is no sensor, so you have to press a button to switch from rear screen to EVF, and back again.? That may not seem like a big problem, but when you're trying to capture wildlife it just adds another step to the process.? 2) The EVF seems a bit dim and small.? There are a lot of special functions and settings with the camera, which is good.? Another problem I've had is soft focus and trouble focusing at full zoom.? I end up discarding some shots because of this.? Overall, however, it is a good little camera. Rated 5 out of 5 by William from Great fun I use this camera to reach out farther for animal shots and it gives me more distance for insect pics. I do find using a monopod for the long shots gives the best results. This isn't my first superzoom from Panasonic and it won't be my last because they just keep getting better and better. And what can I say about B&H, you're the best. Are you able to take a 60 second exposure at more than 80iso? There is a Bulb mode within the Manual control setting. This will allow you to expose for any desired length. 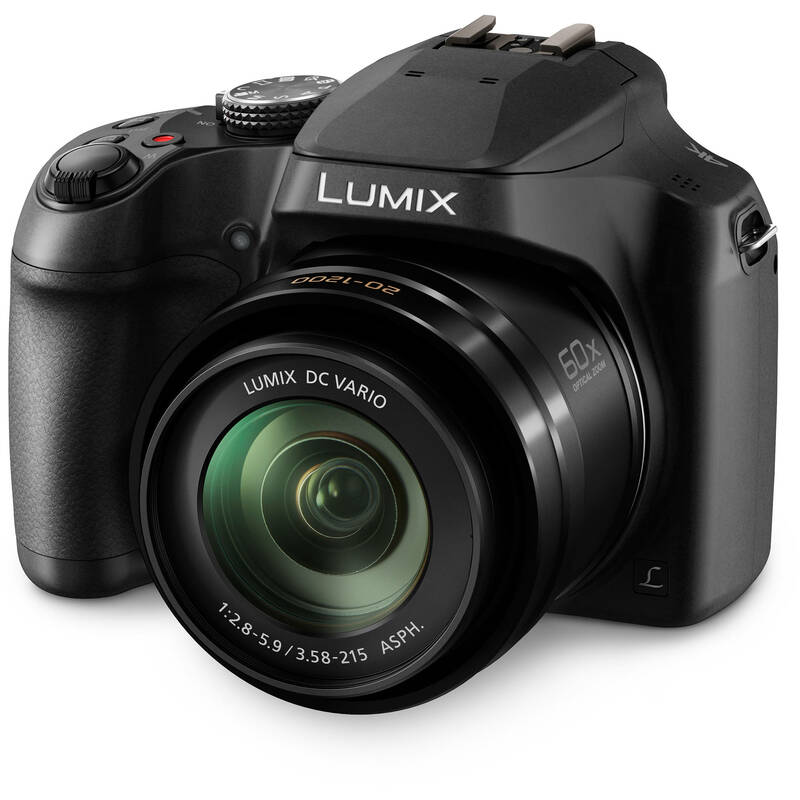 Will the LUMIX DC-FZ80 take RAW photos in the burst mode? No, burst mode is JPEG only. I love taking separate photos of a scene and stitching them into a panorama afterward using software (i.e. the old style panorama mode). Is there an Exposure-lock setting on this camera to achieve this? Am I able to accomplish this in Manual Mode? There is an auto exposure lock button on the back of this camera. Why do you have external mic in the accessories? Does this camera have a plug-in mic port? No, it does not have a plug in mic port but if you buy an external video recorder you can plug an external microphone into those. Does this camera have an external microphone input? No, it does not have a microphone input. Does the lens have threads to attach UV filters? Interested in a camera for indoor sports (basketball) -- can anybody comment on how this camera does in that setting? This camera is perfect for that. It has a burst mode which is pretty much a motor drive so you won't miss any thing. Indoor shooting is awesome. There's also a 4k burst when taking video of fast moving objects.